Here on the Isle of Mull everything appears to happen in half time. The roads around the island are single track so no one can drive too fast. The otters appear when they want to, and not until. And the restaurants are few and far between: but no matter, because quality always trumps quantity. All of which is a long way around of saying that Cafe Fish in Tobermory on the Isle of Mull is well worth a visit when you are next passing. Which makes the restaurant sound less excellent than it is, because no one passes Tobermory, everyone comes here on purpose. Which of course is the best way of doing anything, but not how things always work out. Cafe Fish is proud of the freshness of its fish, and the high standards in their kitchen. Their culinary flair is reflected in the high numbers that get turned away from their doors for not having booked. 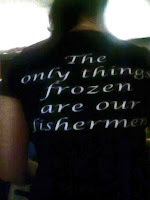 “The only things frozen are our fishermen” is printed on their Cafe Fish T-Shirts, and on their business cards and the freshness of their shell fish are on display. For a corner of the world that does rugged scenery better than most it is an enterprise that has succeeded where many others have failed. The restaurant business is every bit as treacherous as the rocks around the island, but Lindsay and Carolyn McDonald have succeeded in building a reputation that resonates for miles around. Good quality fayre, cooked well and served with a smile appears to be as popular with tourists as it is with locals. Restaurants by their difficult nature are always interesting - as a customer it is the details one notices, but as a business it is the quality and word of mouth recommendations that make the difference. The Restaurant at the end of the World almost made up for the complete lack of otters in Tobermory harbour this afternoon. Although tomorrow, said Scarlet, is another day. I had long wanted to see Kinlochleven and its hydro electric plant. Built during the 1900’s it was one of the first of Scotland’s many hydro electric schemes. The small hydro electric plant originally powered British Alcan’s aluminium smelting works which was a major employer during its heyday. Out of a community of about 1000 people, over 800 were employed within its gates. It has been closed since June 2000, modern day economies of scale having relocated the smelting works elsewhere. But the hydro electric plant remains, and what a wonderful feat of engineering it is. Starting at the power station the path follows the six vast water pipes upwards. The pipes appear to climb into the hills. 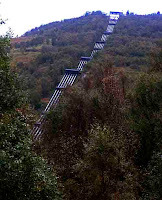 Of course, they are not climbing, they are falling: six huge pipes, maybe three feet or more in diameter, falling 300 metres from the Blackwater dam to the electricity generator below. The pipes carry 20 tonnes of water a second, powering a 20 MW power station. The climb is steep with the pipes in view, but what follows is every bit as remarkable. From the dam to the pipes is a conduit carrying the water some 5 miles down the valley. It is a long but pretty trudge amongst the beautiful Scottish hillsides until the dam is reached. Sitting beneath its vast and almost vertical wall one cannot help but speculate as to the havoc that would be wreaked if it failed to hold its powerful charge. Close to the dam is a small graveyard remembering the navvies who lost their lives during its construction. It is poignant and atmospheric. In December 2008 the 100th anniversary of the deaths was remembered with flowers and wreaths. The unknown navvy, which in truth is many unknown navvies, is remembered lest we forget the price that was paid for this sustainable power. Kinlochleven’s hydro electric plant today looks more like a Victorian mill than a power station, but the splendour of its engineering, and the sustainable path it has cleared for others to follow, is a wonderful legacy for those who worked on it. The importance of good goals and good planning comes up over and over again in Performance Management. You simply cannot perform well if you don’t know what you should be doing, or why you should be doing it. It sounds so obvious, but somehow day to day stuff often gets in the way. Work in a distraction free zone. This is important for any kind of work, but particularly for planning. Some people find classical music helps to really concentrate; personally I like quiet. Planning necessitates ignoring the minutiae and concentrating on what’s really important; what will really make the difference. In order to find those important ideas, you have to give your mind space and time. Work in multiple time horizons. Ensure you have the long term goals and ambitions right, but also ensure you have planned out what you need to do this week, this month, and this quarter to achieve your goals. Work through the pain. Planning is difficult and there is always a temptation to do something easier, or something that will give an immediate payback. Stay with it, feel the uncomfortable feelings of not knowing, and work it through until the plan makes sense. Include numbers. Numbers being dates, estimates, quantities and financials. Unless you can quantify how long something will take, or how much money it will cost or generate, or when it must be done by, it isn’t a plan. It’s an un-thought-through wish list. Collaborate. Plans that have been done with other people are better plans than those done alone. All plans require other people to make them happen, so include them in the planning process. Ensure that those doing the work are able to contribute. Ambitious plans that require everyone to work together need to have everyone’s input right at the start. Finish it. Planning is a valuable tool to refine and improve thinking, but it also makes sure you have a roadmap moving forward. Planning that takes so long that it never gets finished, and never gets used, might as well never have been done. Set a time limit, work hard and well, and get a decent plan together that can be used. You can always refine it later. Enjoy the process. Rather than seeing planning as a drag, enjoy the mind-expanding experience. Planning is a time to see the world as a better place through our actions and our work. What could be more enjoyable than that? Planning and goal setting is such a fundamental part of achieving anything that it is worth thinking about how to get the environment right to do it better. What are your top tips to better planning? What does excellence mean for your business? Achieving anything of value is normally a process rather than a one-off activity. Whether it is writing a software system, arranging a conference, or writing a report there will be elements that are unique, and elements that are repeated time after time. By reviewing what went well and what didn’t go so well, we can gradually improve performance and quality. It is tempting to see each activity as unique, but identifying commonalities helps to establish a framework or a method, thus enabling improvements to be made. A goal. The project goal must be measureable and agreed. If more than one person is involved in the project, then the goal has to be understood and agreed by everyone. Not understanding what you are aiming for is the biggest single reason for failure, so whether or not you plan to review afterwards, it pays to get your goal clear. A quality standard. The standard to which work should be done must be explicit. There is a huge difference between, for example, a first draft of a business plan, and an agreed, finished, actionable business plan. Work out which you are aiming for before starting the project, otherwise those proverbial camels will start to appear at your project review. A time period. The date by which the project should be completed, to the agreed quality standard, needs to be agreed at the outset. This encourages better planning, and provides a clear target for the work. One common argument is that you don’t necessarily know how long the work will take, or to what standard you might be able to complete it to, etc. This may be true. However, by thinking hard before the project starts about what you want to achieve, and a realistic timeframe in which it might be achieved, you not only improve the initial planning and project scoping, but also provide the right environment for a review to be carried out afterwards. By following up after the project has been completed you can identify what went well, and what could have been done better, thereby improving your performance next time around. Make sure you include time to carry out the review in your planning, so that it actually gets done. The world is happily divided on working tidy. Many people are proudly disorganised. I spoke to one such contented individual the other evening. “You wouldn’t be able to find a thing in my office”, he boasted, “but I can find everything!” I had a mental image of what his desk might look like, and wasn’t entirely convinced by the argument. There was clearly no point in debating the point; maybe he is extremely creative/efficient/happy with his working style. He probably is. Focus. Tidying, filing and clearing allow focus on what’s important, rather than what’s on top on top of the pile. Using email or a postal in-box as a “to do” list does not encourage active planning. Working to a plan ensures the important, as well as the urgent stuff gets done. Calm. Seeing papers, emails or other clutter around constantly pulls the mind away from the task in hand. It’s like having a little voice constantly saying “isn’t this more important?” “why don’t you work on this?” “have you forgotten that?” A clear desk and empty in-box stops the voices and helps concentration. Prioritise. Clutter is just a pile of stuff that hasn’t yet had decisions made about it. 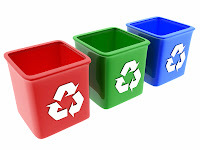 By taking time to file and tidy things away decisions are made: whether the decision is to bin it, act on it, deal with it later or file it for reference. The alternative is just a big pile of work waiting to be done. Sorting enables priorities to be established, planned, and acted on in a timely way. Meet deadlines. What I really mean is don’t miss deadlines, because that’s what happens when things don’t go in the right place. Things get missed because they are not on the top of the pile. Not always, but it happens. Make decisions in the here and now. Some decisions benefit from settling time or waiting for more information. Some decisions are just not important enough to deal with at all. But sometimes things get left in the clutter because they are too difficult or it has become default behaviour. Working tidy enables decisions to be made when the job is current, which means the work gets done faster and better. Finding things. This is purposely last on the list rather than first. Although I have occasionally lost something and spent time looking for it, it doesn't happen very often. In my experience many messy people do know where things are – they have secret systems for which pile said item has been placed. So although finding things quickly is a benefit, I don’t rate it as highly as others on this subject, such as Giles Morris writing in The Guardian a few months’ ago. I have no option but to keep my project work tidy and filed in systems that are designed to ensure important work doesn’t go astray. But not everything is project work, and for me at least being tidier with all my work is paying dividends – big time. Are you a creative its-somewhere-over-there type who is productive and happy? Or are you obsessively tidy, and reap abundant rewards from your discipline? important that it cannot be done safely and with care to the environment. I came across the American concept of Hypermiling the other day. With petrol prices rising again, getting more out of a tankful becomes slightly more than purely an academic exercise. Hypermiling is the art of driving carefully so as to use the least amount of petrol possible – accelerating slowly and braking less often. It’s quite possible to do; it just requires concentration and not letting other road users’ impatience get to you. Of course, both are an attitude of mind, but for me, at least, it’s the concentration element that is the hardest to do. Not because I can’t concentrate on driving carefully, because I can. It's more because I drive so often. As soon as my mind is onto “more important” things – like getting to a meeting on time, or getting home after a long day, I revert to my old ways. I saw the slogan about the environment on someone’s T-Shirt at the supermarket. It applies to many, many things: perhaps most things. 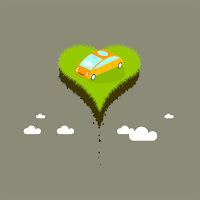 Driving, of course, is such a commonplace activity that there are big gains to be made for safety and the environment. Despite the government putting yet more tax onto petrol, the cost is still not the overriding factor. Yes, savings are nice, but as with energy usage it is still perfectly affordable. So for the time being at least it has to be environmental considerations which change hearts and minds. Could someone let the 4-wheel drive on my bumper know? The worthwhile problems are the ones you can really solve or help solve, the ones you can really contribute something to – Richard Feynman. The Richard Feynman quotation is interesting – as a professional problem solver (more grandly known as a physicist) he had to choose where to direct his time and energy. There were many problems he could tackle, but perhaps only a few where he could really contribute something of value. So it is with all of us, there are many possibilities for how to spend our time or where to direct our talents, but perhaps only a handful of areas where we can really make a worthwhile contribution. Feynman’s quotation is really about choices – either proactive or reactive. What we choose to do with our days, weeks, months and years. How we choose to make a contribution. Or not. Getting to Excellent has grown up a little – not a lot, but a little. From its first terrifying baby steps back in January ’09, today sees the 100th post. I doubt anyone has read all 100 posts, with one very important exception. I don’t know what people read, or even why they read it, but I know a great deal about the exception; because that exception is me. Not only do I write the posts, but I also read and think about them. And whilst I obviously hope that others might enjoy my ramblings, I gain a tremendous amount simply by going through the process of getting my thoughts together and putting fingers to keyboard. When I was a child I wrote a diary and have intermittently written a journal ever since. It was only when I did my MBA that I realised that writing a journal is recognised as a professionally beneficial process. It organises thoughts, and writing imposes a certain intellectual rigour. Tom Peters and Seth Godin are both successful writers, thinkers and bloggers. In a short videoed exchange they extol the virtues of the modern day journal – blogging. Godin makes the point that through blogging ideas are formulated, expressed and refined. He recognises that the benefits are as much for the writer as for the reader. I agree. Being critical of ideas. Blogging forces an opinion on issues, so I make more effort to figure out what is fact, opinion, well researched, worth the cyberspace it's written on, or not. Making sense of experiences. Writing is a great way to figure out what worked, what didn’t work, and why. Through trying to pass on useful stuff, it becomes even more useful for me. Getting feedback. I get feedback from comments, emails and site stats. It’s a wonderful way to connect with a wider community and share knowledge. Learning. Every post requires some research and fact checking, so I learn big and little things all the time. Being accountable. If I blog about something I feel absolutely accountable for it. Accountability is a great way of making changes and learning about oneself. Being reflective. Reflection is a great way of learning: reinforcing positive things, or changing negative ones, and figuring out which is which. 30 minutes or so each day to think about something that is relevant to performance and productivity is a wonderful habit. Connecting with like minded people. It’s true that birds of a feather flock together, and those with the same interests find ways of getting in touch, either directly or by being introduced. Blogging is a wonderful way of connecting with people who are working on similar issues or care about similar things. Refining ideas and practice. I often come back to themes over and over again, refining my ideas all the time. Writing, experience, getting new information and trying different things all get added into the refinement process. Listening. I listen to things more carefully, particularly if I want to write about them. It’s amazing how much more active I have to be in getting things correct, and it’s a great discipline. It’s satisfying. Whatever else is going on at work or at home, Getting to Excellent gets more readers and more interesting all the time, which is a tremendous source of satisfaction. Which I suppose is another way of saying I enjoy it. As I said in my first post, the world didn’t need another blog, but it got one anyway. Getting to Excellent has chalked up 100 posts now, and gained some regular readers. At least one person is getting a great deal of benefit from it, I hope a few others are too. Thank you to everyone who has read, agreed, disagreed and commented on its contents. I consider myself to be reasonably strong willed, but over the holiday weekend I succumbed and broke my 100 day challenge by having a cup of green tea. It seems quite comical that this is a big deal – as far as I know green tea is a perfectly legal substance all over the world. I wanted to find out how long it takes to form a habit and at the time giving up caffeine didn’t seem a particularly onerous challenge. Appearances are clearly deceptive. It seems it is going to take longer than 35 days for this little lady to form this particular habit. My weakness was rewarded by a sleepless night, which I readily admit may or may not have been caused by the caffeine. Yesterday was a beautiful sunny day, and strolling through a pretty and ancient market town the little voices in my head insisted that just one cup would do no harm. In fact, the little voices in my head had been reminding me of just good tea tastes, and all that I had been missing. Many people have asked me why I was giving up caffeine – they had pointed out all the benefits, including health benefits. I had already talked myself into the idea that I would return to drinking caffeine once the 100-day challenge was over. Clearly I was setting myself up for a fall, which was exactly what happened. After having watched “Sink the Bismark” last night I now know that worse things happen at sea, so there is little point brooding over spilt tea. The question now is whether to quietly abandon the challenge after having gone public over my lack of willpower, or whether to start again and commit to another 100 days? After briefly reviewing the “caffeine is a good idea” camp this morning, I remain sceptical that caffeine is a necessary component of peak performance. Clearly there are benefits, not least of which is the instant pick-me-up for sleepy-head mornings. But I’m not sure they outweigh the racing heart-beat that goes with drinking too many cuppas. I am sure those more disciplined than me drink caffeine in more moderate amounts, but I have never been known for moderation with anything. So, it’s back on the tea-free wagon for another 100 days. Oh, the joys of being stubborn!